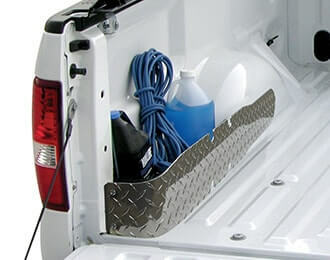 Prevent items from sliding to the front of the truck bed. 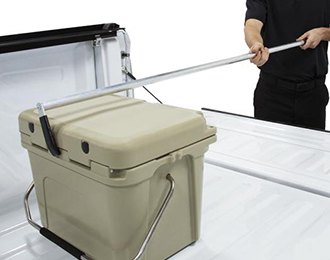 ACCESS® Cargo Management Kits combine the convenience of ACCESS® Truck Bed Pockets and EZ-RETRIEVER® Cargo Reaching Tool into one affordable price. Create valuable storage from wasted space with ACCESS® Truck Bed Pockets and retrieve out of reach cargo by using the EZ-RETRIEVER® Cargo Reaching Tool. No more crawling into your truck box. 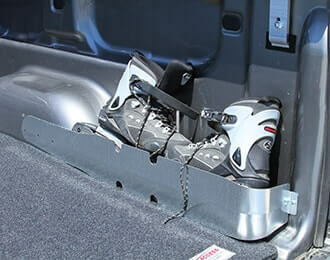 EZ-RETRIEVER® extends to 5' 9"
Note: The ACCESS® Truck Bed Pockets are not compatible with Stepside boxes. ACCESS® Truck Bed Pockets G2 are 5" high pockets in galvanized steel, aluminum or stainless steel. ACCESS® Truck Bed Pockets HD are 6" high aluminum pockets with diamond plate tread. 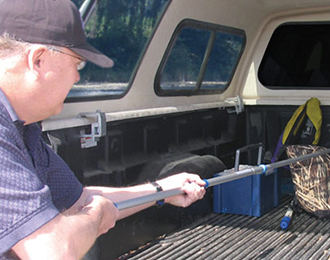 EZ-RETRIEVER® Cargo Reaching Tool extends to 5' 9". EZ-RETRIEVER® II Cargo Reaching Tool is fixed at 5'. Absolutely love this product. Makes storing under my pickup bed cover the needed items for hauling or emergencies the easiest, most secure and easy to get to of anything I've seem. Totally durable, good looking and a great addition to any truck. I have shown and recommended these to all my friends with trucks. Side pockets are great, took seconds to install and EZ-retriever is great, very easy to use. The Truck Bed Pockets allows small items to be stored at the back sides of the box without them sliding all over the box. The included EZ Retriever is great for retrieving items in the box when the tonneau cover is on. All in all, this was a great buy and very useful. Pretty simple concept but they keep all the little stuff from rolling around my bed. The EZ-Retriever is the greatest thing yet, extends pretty far. Pretty simple concept but they keep all the little stuff from rolling around my bed. The EZ Retriever is the greatest thing yet, extends pretty far. Liked the Kit, installed easily, instructions were great, very easy to follow.